Summary and Definition: The Choctaw tribe descended from the ancient mound builders located in the Mississippi River valley. The Choctaw people moved across the southeast and established large, organised settlements in Mississippi, Alabama, Florida and Louisiana. The Creek people were farmers growing crops of corn, beans, squash, trading surplus produce to other tribes. The above picture depicts Mushulatubbee, meaning "Determined to Kill" who was a Chief of the Choctaw. 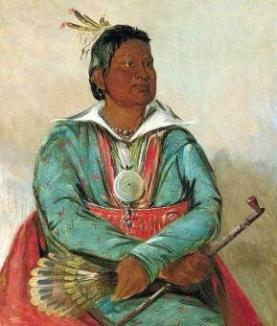 It was painted by the famous artist George Catlin (1796-1872) in 1838. The chief wore European-style clothing, as worn by many of the southeastern tribes with a decorative sash around his waist. Mushulatubbee led his warriors to assist General Andrew Jackson in the Creek War, also known as the Red Stick War (1813�14). What was the lifestyle and culture of the Choctaw tribe? The Choctaw tribe are descendants of the people of the Mississippian culture, who built earthwork mounds at their villages located throughout the Mississippi River valley (refer to the Natchez Tribe for more facts). The Creek people established villages across the Deep South and used dugout canoes to travel and trade with many other tribes. Their numbers diminished due to the diseases brought by the Europeans including the Spanish, French and British. They allied with both the French and Americans against the British. Following the War of Independence the 'civilizing programs' began. The Choctaw fought under Andrew Jackson in the Creek War (1813�14). Many Creeks adopted European practises such as European style dress, housing and farming techniques but despite this and their loyalty to the Americans they were sent to reservations. The Choctaw tribe became known as one of the Five Civilised Tribes who also included the Cherokee, Creek, Chickasaw and Seminoles tribes. Where did the Choctaw tribe live? The Choctaw are people of the Southeast Native American cultural group. The geography of the region in which they lived dictated the lifestyle and culture of the Choctaw tribe. The Choctaw played stickball (called kabucha in Choctaw), the forerunner of lacrosse. The picture by George Catlin depicts Sioux and Choctaw stickball players. One team painted themselves white to distinguish them from the other team. As many as 100 - 1,000 men from opposing tribes or villages would participate in these games. The ball was caught with a netted ball-stick. What clothes did the Choctaw wear? 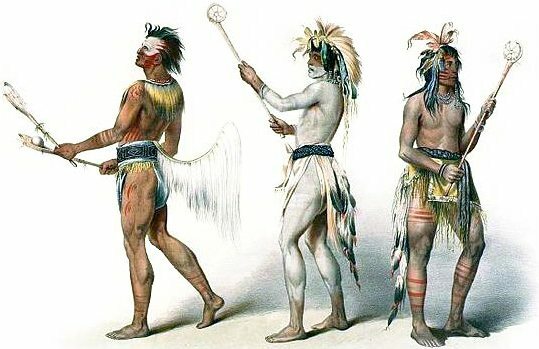 The Choctaw men wore breechcloths made from deer skin or bark fabric. The early Creek women wore a knee-length skirt, also made from a bark fabric or deerskin. The above picture shows how the style of clothes worn by the Choctaw in the 1800's were greatly influenced by the Europeans and the availability of trade cloth. What did the Choctaw tribe live in? The Creek tribe lived in different styles of shelters over the years. The Mississippian culture people built earthwork mounds at their villages with grass houses, built using a framework of poles and beams covered with wattle and daub mud. The walls were then covered by cane mats and a thatched grass roof. The ancient style evolved into the wattle and daub house made by weaving river cane, vines and wood into a framework, then coating the frame with mud and crushed shells. The roof was either thatched with grass or shingled with bark. 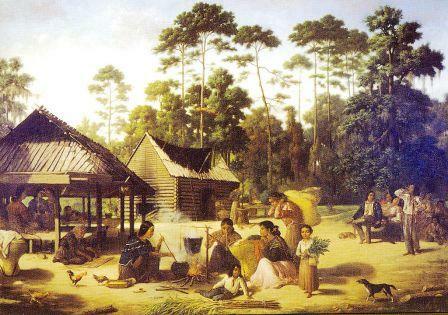 The American settlers brought new ideas and sharp tools that replaced the stone axes, and some of the Choctaw began to build villages of American-style log cabins as can be seen in the 1869 picture. What language did the Choctaw tribe speak? The Choctaw tribe spoke in several related dialects of the Muskogean language family. What did the Choctaw tribe eat? The food that the Choctaw tribe ate included their crops of corn, beans and squash. They produced enough surplus produce for trade with other tribes. Creek men also hunted deer, wild turkeys, small game and fish. What weapons did the Choctaw use? The weapons used by the Choctaw Native Indians included maces, war clubs, knives, bows and arrows and axes. The Europeans introduced muskets and then rifles. Their main enemies were the Chickasaw tribe. Choctaw History: What happened to the Choctaw tribe? The following Choctaw history timeline details facts, dates and famous landmarks of the people. The Choctaw timeline explains what happened to the people of their tribe. 1542: The Hernando De Soto expedition encounters the Choctaw.